In last five articles, I covered several key areas of debt market and abuses. This article is to highlight the governance on issuances of International Sovereign Bonds (ISB). ISBs were introduced in 2007 to expand the outreach of the govt. Debt market to cross-border as the market mechanism was considered to be economically better than privately arranged debts. The transparency and secondary market are expected to promote price discovery and liquidity in debt markets similar to other markets. ISBs also were sought to be a major source of raising foreign capital/exchange in view of structural BOP deficit in the country. Issuance of ISBs was expected to develop a sovereign yield curve/term-structure of interest rates for US$ debt based on ISB secondary market to facilitate the capita/investment flows to both government and private sector. 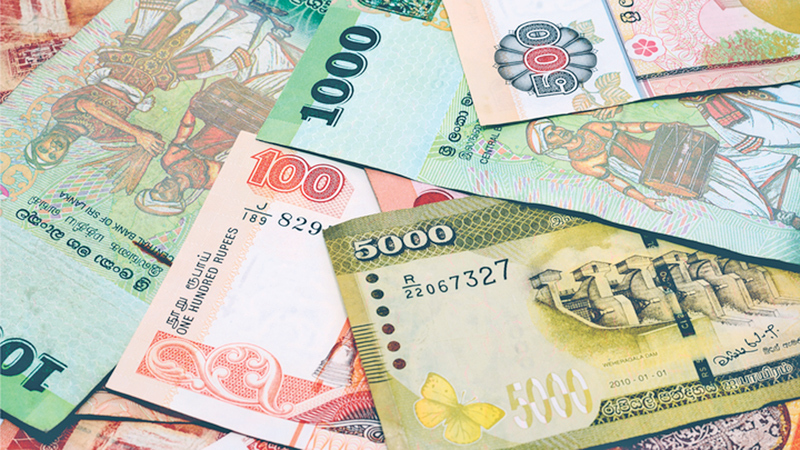 Investment banks in Japan, China, Malaysia and Middle East also frequently approach Sri Lankan authorities to market their currency debts also to develop yield curves in order to help diversify the debt market into other currencies so that the risk and cost can be lowered. As a result, the Central Bank (CB) recently talked about issuance of Samurai and Panda bonds. International proposals were invited from investment banks to cover Yen, Renminbi and Euro also for 2019 ISB issuances. Therefore, some analysts praised the listing of ISBs this time on the London Stock Exchange in addition to Singapore Exchange Securities Trading Ltd for further market development although no economists or financial experts are concerned about not listing local Treasury bills and bonds even in Sri Lanka or not trading them at a common electronic platform, despite the CB being the debt issuer, debt manager, fiscal agent and financial adviser to the government. In early 2015, a Monetary Board decided to list Treasury bills and bonds on Euroclear system and assigned the task to Monetary Policy Deputy Governor (DG). Cabinet appointed-procurement for electronic trading platform commenced in 2016. No progress is reported even after two years. So far, ISBs have been issued in 14 occasions for a total of US$ 18,050 mn whereas present outstanding is US$ 16,050 mn. ISBs are now required annually whereas annual issuance has tended to rise in the past few years (see Table 1). As a result, ISBs have become a major source of debt, i.e., 45% of foreign debt and 22% of total debt and a major source of inflow of foreign capital for BOP and foreign reserves. Therefore, the country is now addicted to ISBs where any issuance is celebrated, despite looming bunching problem (see Table 2). Last week, some analysts raised serious concerns on high interest rates offered on ISBs of US$ 2.4 billion (about Rs. 429 bn) issued on March 7, 2019. Some commented that such high interest rates are due to a scandal of commission. This is the 14th time of ISB issuance and the government cannot appoint a Presidential Commission at each time of concerns over debt issuances. Given such concerns on government securities market being revealed and looming unsustainable debt stock, any new concerns should not be lightly disregarded as concerns could be whistleblowers of possible roots of market abuses as well as cost and risks to the public. The CB, despite it governed all ISB issuances so far with its top international economists, did not provide any technical/professional response to allegations, at least an intellectual response of their market jargon. In response, few political leaders blamed the 52-day Constitutional crisis that caused downgrades of international credit rating of Sri Lanka in November/December 2018 as the reason for high interest rates. As usual, the past government also was blamed for debt. A comparison of interest rates in ISB secondary market was cited to establish the fairness of interest rates. For example, ISBs were traded at interest rates less than 6% as at October 26, 2018 and rose to 9% as at November 29, 2018 after the constitutional crisis due to the instability in an illegal government and downgrade of international credit rating. With returning to normalcy, interest rates had gradually gone down to 6.7% for 5-year ISBs which is the reason for borrowing at 6.8% (5-year ISB) at this time. Similar technical/political reasons are given for alleged bond issuances worth of trillions of both privately issued bonds and some auctioned bonds. However, nobody seems to propose to examine the governance side of ISB issuances whether the interest rates are justifiable in good market governance by the issuer/CB. This is different from acceptance of desperate money to bailout the CB and government. Allegations on all past bond issuances are connected with the lapses in governance. Interest rates fluctuate frequently due to various market factors and, therefore, their levels can be argued in any way analysts wish as they are not exact sciences. However, if there are serious lapses in issuance governance, any interest rate could be seen as an abused rate being not reflective of fair market/economic factors. The ISB issuance governance system contains several players. The CB/Monetary Board, Ministry of Finance, Attorney General and international legal counsels, Cabinet of Ministers, Investment Banks/Lead Managers, Trusties, Credit Rating Agencies and Auditor General. The process involves in several documents/activities such as appointment of Lead Managers (Investment banks who market the bonds and collect bids), Monetary Board approvals, Attorney General clearance, Cabinet approval, international road shows, offering circular/prospectus, communication with investment banks (mostly conference calls) and credit ratings. The process has now become routine as ISB issuance is an annual event. Everybody just does what is available in flies without any improvement to the process and debt sustainability. Although the public is not aware of details, the process itself contains some checks and balances for the public accountability of funds. The Auditor General is the final layer which has the access to all records and information to audit on possible abuses and economy and efficiency of funds raised as well as used, given the extent of importance and risks of ISBs to the public. The offer document/offering circular used for the previous ISB is updated at various staff level to include latest Sri Lankan data, mostly economic. It is a highly bureaucratic document with mostly numbers updated within a short period where nobody reviews it to be a readable marketing document. Nobody will have any interest in reading it. After the offering circular is released to the market, Sri Lankan authorities should observe the radio silence, i.e. should not make any views in public on the ISB. This is to avoid any external influence in ISB investors. There is an ISB Steering Committee to be chaired by the DG supervising the public debt. However, other than few correspondences signed by the DG, the Committee does not have any meetings or records. The Public Debt line is only a clerical job. All high-level interactions and road shows with lead managers and investors are handled by the Deputy Governor supervising the monetary policy without any delegated duties on debt or ISBs. Investor-meetings are held routinely throughout the year while the frequency rises during the ISB time. Other than relaxing international travels, no reports on the progress, outcome of travels or market issues are recorded and filed for internal control and future policy purposes. After several interactions and conference calls with lead managers, ISB is open for biding at a day selected on the advice of the lead managers. It is first open for Asian market and then for European and American markets. Few conference calls take place during the day to update on the investor sentiments as lead managers feel. A guidance interest rate (yield rate)/initial price guidance as recommended by the lead managers at the opening conference call is announced. The guidance rate is sometimes revised for European and American markets. Nobody knows any economic or financial criterion used to determine the guidance rate. As such, investment banks drive bids from their customers around the rates which is not reflective of the real price discovery. For example, as per the CB’s press release, the guidance rates for the last ISB were 7.20% for 5-year ISB and 8.20% for 10-year ISB. Final price guidance has been reduced to 6.90% (+/- 5bps) for 5-year ISB and 7.90% (+/- 5 bps) for 10-year ISB during the day. This is 30 bps reduction from initial guidance. The ISBs were finally priced at lower yields during New York market time as 6.85% for 5-year and 7.85% for 10-year ISBs. This shows a reduction of the weighted average yield rate by 35 bps from initial guidance. The governance issue here is why bids were coming at lower yield rates than the higher guidance rates. Generally, it is other way around for a country like Sri Lanka whose creditworthiness is very low (possible default rating). Someone can argue ex-post why a lower guidance was not issued to try lower rates. The governance issue is grave as the CB does not have any criterion to decide the guidance rates which distort the market mechanism. One can allege for issuance and market manipulation as nobody knows how lead managers dealt with their clients/investors. During the day, a summary of bid list, name and amount, is sent through the email to the CB. Bid prices/yield rates are not disclosed. The final yield rate/coupon rate is the weighted average yield of accepted bids. The CB is not aware of bid yields or cut-off yield. Further, in all three latest ISB issuances, the difference of interest rates between 5-year ISBs and 10-year ISBs has been exactly 100 basis points, despite competitive bidding at different times. At the last conference call at the night attended by local representatives of lead managers, total amount and ISB coupon/interest rate accepted are informed verbally and the CB Governor assisted by the Monetary Policy DG okays it instantly. At the conference call I attended in 2016, when the yield rate was agreed so, I inquired where were the bids to confirm it. Then, a senior of the Monetary Policy team responded immediately that bids are not disclosed. The CB treats investment bankers as gods, despite they are behind almost all financial scandals and crises in the world. Their acts of market manipulation are well-documented. The last global financial crisis was caused by investment banking on complex structured financial products engineered on subprime mortgages. All high-profile rogue traders in banks are investment bankers. The recent 1MDB scandal in Malaysia is due to a rogue investment banker of Goldman Sachs which had fraudulently charged nearly US$ 600 mn of fees from 1MDB for its international bond-raising of US$ 6.5 bn in 2012-13 through a complex web of opaque transactions and fraudulent shell companies that led to misappropriation of nearly 50% of bond proceeds. The US Federal Reserve expelled the alleged Goldman’s executive Tim Leissner from the industry. Malaysia fights for recovery of money. The Malaysian Central Bank Governor also had to step down on June 6, 2018 consequent to an allegation that adjoining state land had been purchased by Central Bank without the tender procedure where the government routed sale proceeds to 1 MDB for repayment of alleged debt raised by 1 MDB. The CB does not have any voice recording or minutes of meetings and conference calls singed and filed to prove how many time-critical decisions are made in fair/accountable manner. The lack of process documents and dominance of same high-level officers for all ISB issuances without any delegated duties/responsibilities may raise grave governance issues. The CB’s Research Department does not prepare any independent market reports to check the reliability of advice given by investment banks. One of the criteria published to select lead managers is the indicative coupon rates for different tenures proposed by them for prospective ISBs. No post-examination is done whether such indicative rates were ensured/reliable within market conditions or the final coupon/yield rates. Concerns over interest rate decision may have valid grounds as an analyst who praised the market mechanism of the ISB issuance process in early 2017 praised the ISB issuance in April 2018 for issuing under private/direct placements to secure lower interest rates by compromising the market mechanism. The CB did not make any comment. At the last conference call, allocation of ISBs among the market regions and investor categories also is informed. However, the allocation policy adopted by lead managers is not known whether it is based on competitive bids below the cut-off or any other selection criterion. Allocation was nearly 80% to the Europe and US and 90% to fund managers. The Auditor General has never audited issuances of ISBs as well as Treasury bills and bonds, at least the process from the original records. Internal audit being officers of the CB transferrable at any time is rarely dared to audit any of public debt issuance and governance system, given the CB’s top-level connection to debt issuances and dealers. ISBs have become not only a major source of annual borrowing of the government but also a major source of maintenance of foreign reserve of the CB. 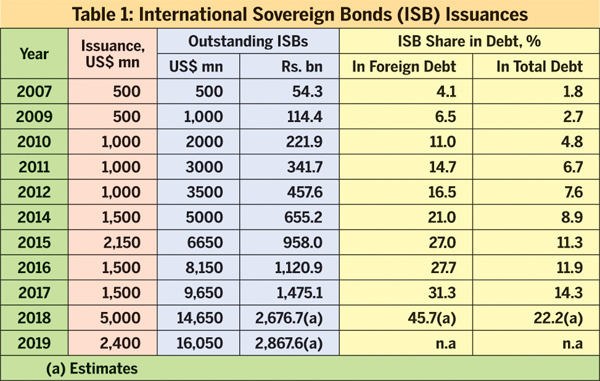 Risk of ISB repayment seems high as second and third ISB repayment (US$ 500 mn in January 2015 and US$ 1,000 mn in January 2019) were made from CB’s foreign reserves. The government finds difficulties to pay for the foreign exchange underlying the repayment. Therefore, the government and the CB have no early arrangement to repay ISBs. The bunching also looms high in the near future. Annual interest payment may have risen to around US$ 500 mn (yield rates ranging from 6% to 8%). Although Active Liability Management Law is in place since 2018, no action has been taken to resolve the bunching problem and high interest payments. As the CB’s monetary policy has no focus on promotion of foreign investments and exports, foreign reserve crucially depends on ISB issuance. Very soon, issuance frequency also will increase due to canvassing by those investment bankers familiar to the CB’s top. The government is not worried about any of risks or cost or issuance governance as political leaders need only the money for survival in few years of office. The CB has not assessed whether a sovereign yield curve exists, and interest rates of other foreign borrowings are guided by this yield curve. Very soon, ISB issuances will be interpreted as another monetary policy instrument used to stabilize foreign exchange market similar to justification of private issuances of Treasury bills and bonds or unusual bond hybrids used to control domestic interest rates and monetary policy transmission mechanism in the past decade, despite the monetary weaponry empowered in the Monetary Law Act. Therefore, ISB will be a possible source of a debt bubble in the next decade unless the government restructures the debt portfolio as the CB is only interested in raising debt somehow to please the government in violation of all basic laws. Therefore, an audit on governance system of the ISB issuance may be necessary to ascertain whether interest rates on the last ISB issuance of US$ 2.4 bn are justifiable in the current market context.